Published by Mountainblog on 06/21/2017 . 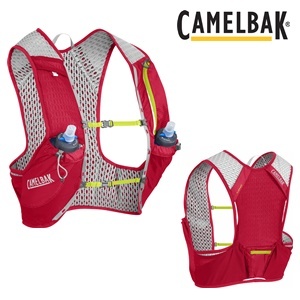 Camelbak further expands its range of running vests and backpacks and introduces NANO™ VEST, a super lightweight vest that adheres to the body like a glove. It weighs a mere 150 g. Dedicated to the trail running professionals or the everyday minimalists, NANO VEST offers 3L capacity, including 2L cargo and 1L hydration. The vest comes with two Quick™ Stow flasks, each 0,5L. NANO VEST is made of superlight and durable Nylon 70D, with CamelBak’s exclusive 3D Poly Mesh on the back and shoulders, for the maximum ventilation. The perfect fit is guaranteed by the double sternum straps that are adjustable both in width and height. Three available sizes: S-M-L. The vest is equipped with easy access poles attachments, zippered pocket for the valuable items, double side pockets and an expandable pocket on the back.